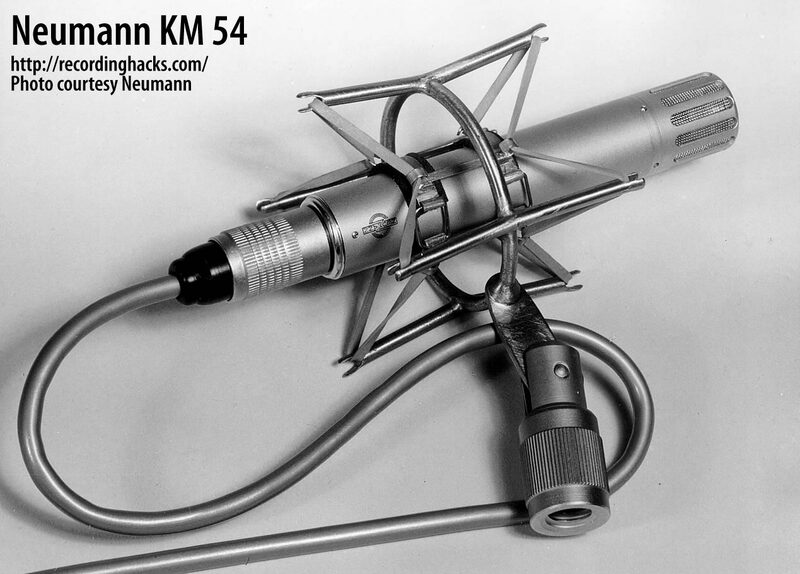 The KM 54 was a Cardioid pencil condenser microphone with a tube amplifier circuit. 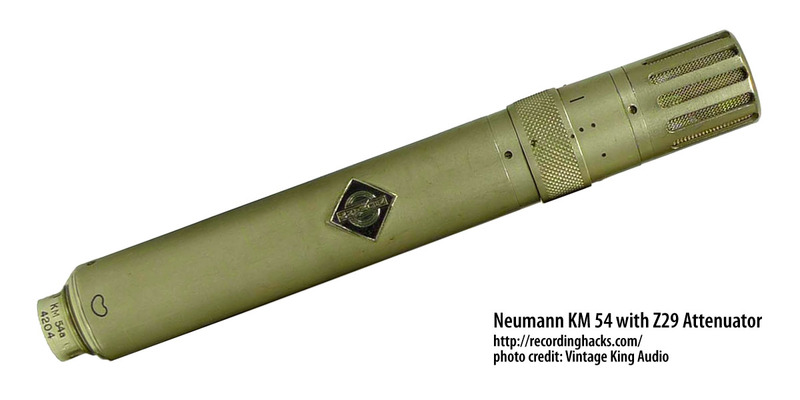 It was the second of Neumann’s “miniature microphone” series, following the omni KM83; the model name ‘KM’ stands for Kleine Mikrofon. 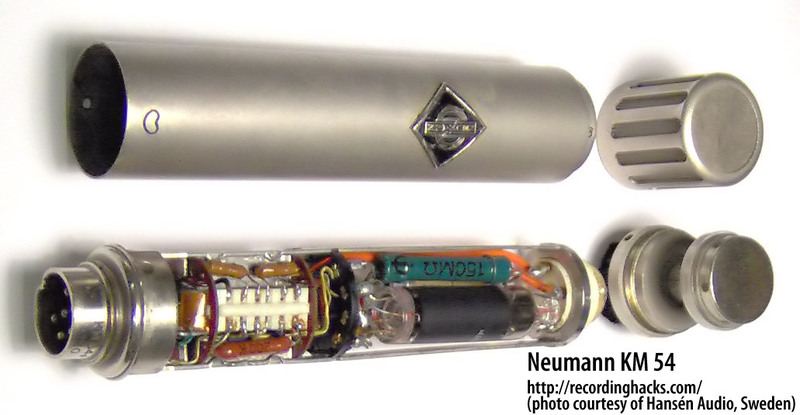 The tube in the KM 54 was a Telefunken AC 701, a subminiature triode also used in the M 49 and M 50, and several other models. 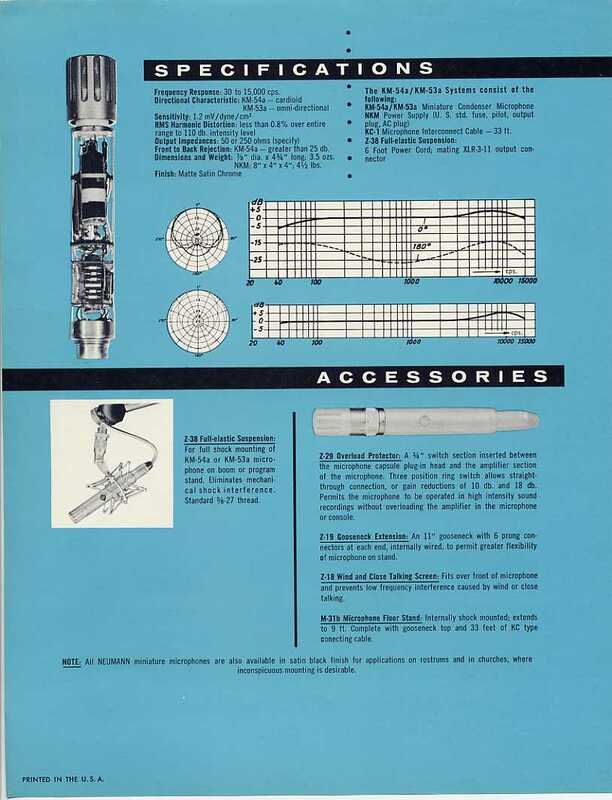 The capsule had a diaphragm made of nickel. It was extremely thin, at 0.7 microns. 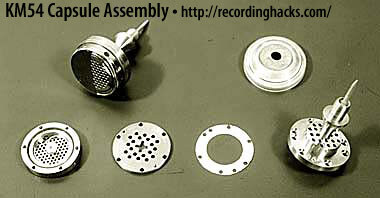 Neumann manufactured these diaphragms via galvanization — Neumann engineers coated a sheet of copper foil with nickel, then dissolved the copper away to leave behind a nickel film. the backplate, as seen from the rear. 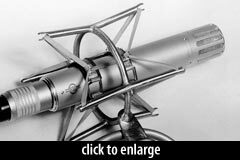 The capsule’s directional characteristic was created by the use of a “delay plate” or acoustical labrinth, which delayed the sound entering the side and rear of the microphone slightly, so as to cancel out the same sounds hitting the front of the diaphragm. 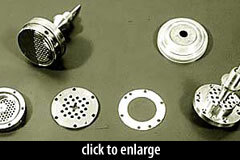 This design gave the mic 25dB of attenuation of off-axis sounds. 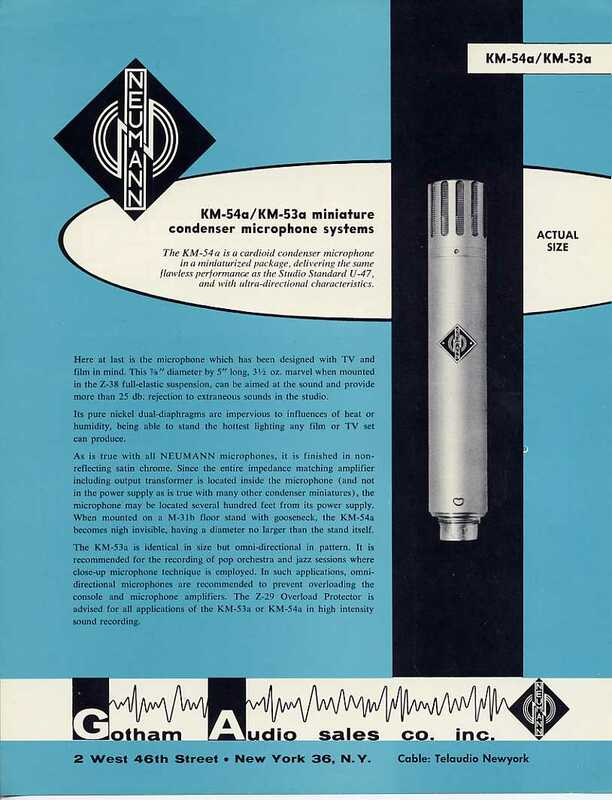 Note that many KM 54 microphones have been retrofitted with capsules from later designs, such as the KM 84; these capsules lack the nickel diaphragm of the original, and can be easily distinguished by appearance. 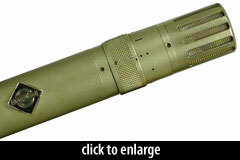 See the capsule vents in the photo at right; the original KM54 capsule vents parallel the length of the microphone. Furthermore, the KM64/KM84 capsule diaphragm was gold-sputtered Mylar, which is a different color than the original Nickel-diaphragm KM54 capsule. The amplifier output impedance is normally 200Ω but it can be connected for 50Ω if desired, resulting in a 6dB reduction in output voltage. Microphones connected for 50 Ω have a red dot beside the number plate. To avoid overloading the preamplifier at very high sound levels, an attenuator type Z 29 can be set between the capsule head and the amplifier section of either microphone KM 53a or KM 54a. 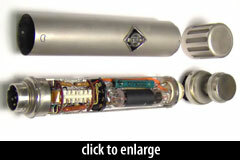 By switching suitable fixed capacitors in parallel with the microphone capsule, a two-element attenuator is formed which becomes effective before the [tube]. The three switch positions of the Z29 attenuator insert give attenuations of… 0dB, 10dB, 18dB for the KM54a. The KM54 was taken out of production in 1969. 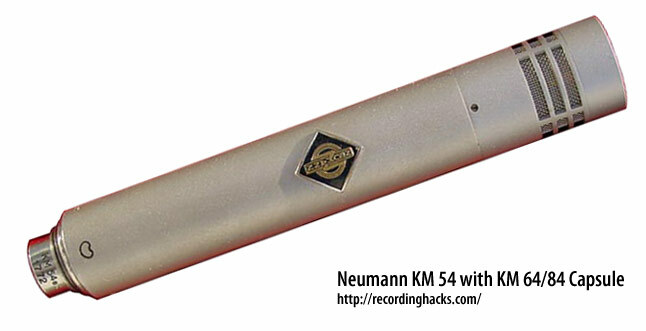 The Neumann KM 54 is also known as: KM54. 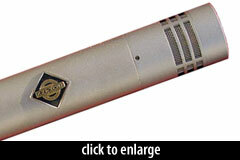 The mic was released in 1954.